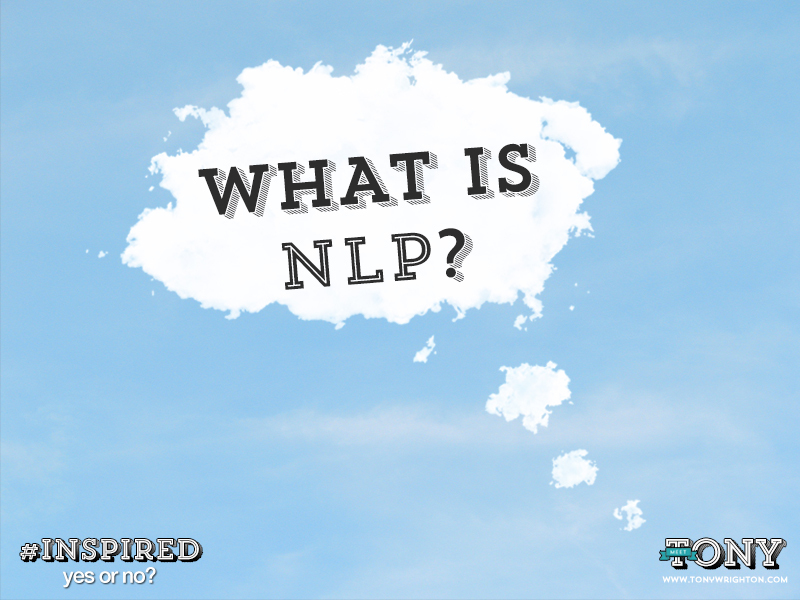 Jan 20 What is NLP? NLP stands for Neuro-Linguistic Programming. It is a set of skills and theories first developed in the 1970s, but yep, it's a rather long and confusing name. Lots of people are interested, and ask me, "what is NLP?". In fact - neuro-hacking would probably be a better name. So here's what NLP does, in simple speak, and here's a quick look at how we can hack our brains to make ourselves live with more energy, vitality and motivation. It was invented in California by Richard Bandler and John Grinder. The back story is quite interesting and worth googling. NLP quickly grabbed worldwide interest and now you can become a practitioner at thousands of venues worldwide. I personally have trained with Richard Bandler as well as lots of other trainers worldwide. Both Bandler and Grinder are still training today. Two books they originally wrote are The Structure of Magic Vol. I & II and Tranceformations. Both are highly recommended, but unfortunately out of print. (I bought my copy of Tranceformations for 50 quid on eBay - now that's dedication to NLP!). NLP is now used all over the world in very wide ranging areas. Businesses use NLP experts to help improve their business, inspire their workforce and refine their message. Individuals use NLP to achieve their goals, motivate themselves, and communicate better with us. Thousands of top sportsmen and women use NLP to win at their chosen discipline, and indeed many of the world's top Performance Coaches are principally trained in NLP. Those involved in sales use NLP to make their product better, to sell their product more effectively, and to make their customers feel better about what they're buying. Tens of thousands of NLP practitioners have helped yet more people get over serious phobias, fears and traumas with NLP. And coaches in all different walks of life use NLP to improve their message and the way that they deliver it to be more effective. NLP is everywhere, and can help you personally and professionally, and can help your business too. NLP Practitioner. An introduction to NLP. In the NLP Practitioner course you will learn a wide range of the basic NLP skills. What is important is continually testing your new skills to improve. NLP Master Practitioner. On the NLP Master Practitioner course, you learn new skills as well as become more elegant and intuitive in your use of the skills you've already picked up. You are starting to help your clients make serious and effective changes. NLP Trainer. The NLP Trainer program tends to focus on platform and communication skills to deliver an effective message to others who might want to learn NLP. When you finish the NLP Trainer course, you are qualified to train others in the skills of NLP. If you are interested in NLP, many providers put on half day or full day 'taster sessions' where you can turn up, sample some of the techniques that are taught in NLP, and then put them to the test. If you enjoy this and find it useful, then you might want to take it further, and even perhaps book on to an NLP Practitioner course. NLP Technique example 1 - Anchoring. Linking thoughts and emotions to something visual/something you can hear/something you can feel is an excellent NLP technique that you can have lots of fun with. It works by making use of the way that the brain links a sensory experience to a thought. For example, ever heard a song and it's reminded you of a wonderful holiday or particular time of your life? That's the kind of thing we're talking about. In NLP terms, it's called anchoring. Have you ever heard of Pavlov's dogs? The famous story where Pavlov rang a bell every time he fed the dogs, and they would start to salivate because they knew they were going to be fed. After a while, he could ring the bell without feeding them, and they would still salivate because they were conditioned to feel that way with the bell. You can anchor great experiences yourself by associating as closely as you can with a great memory. Pick a time - for example - when you felt super confident. Remember how you felt... focusing on hearing what you heard at the time and making the sounds clear and crisp, seeing exactly what you saw and making the colours vivid, and remembering how you felt, and how good it felt to feel confident. As you really start to associate with that experience, squeeze your thumb and forefinger together, continuing to see, hear and feel as you did at the time. Then release... and you have anchored that experience. Later on in the day, or whenever you want to feel that confidence, simply squeeze thumb and forefinger together. That's anchoring - enjoy using this NLP technique. NLP Technique example 2 - Hypnosis. Hypnosis. There is lots of hypnosis and trance involved in Neuro-Linguistic programming. It is an important part of NLP - you can change the way you think and feel by 'rewiring' your brain at a deep unconscious level, and hypnosis is an effective way of doing that. Self-hypnosis is also popular. Many of the hypnotic techniques involved in NLP come from Milton Erickson - sometimes described as the father of American medical hypnosis. For more on hypnosis, please check out The Success Sanctuary, where there are plenty of hypnotic programs ranging from 1-minute (yes just 1-minute) to 30 minutes long. John Grinder and Richard Bandler are the co-creators of NLP, and are still training people around the world. As well as those two, Paul McKenna is widely regarded as one of the world's foremost practitioners of NLP, and indeed he used to own the world's largest NLP Training company. (I was lucky enough to train a little with Paul and it was outstanding.) Paul is also a big supporter of TFT (Thought Field Therapy), otherwise known as 'tapping'. And Tony Robbins is probably the world's foremost personal development trainer. He does not call his methods NLP, but originally trained with Richard Bandler and there are similarities in the approach. I highly recommend his Unleash The Power Within course if you want an inspiring few days, oh and fancy walking across hot coals! To learn more about these experts, you can check out their websites. The great thing about NLP is the more you learn, the more you discover different approaches which you can then combine into creating your own unique style. I hope this article helps you learn a bit more about NLP. Once you start to think of NLP as hacking the brain to be more effective, it hopefully starts to make more sense. I am a qualified NLP Trainer, combining this with other skills and trainings that I have taken, and I would be happy to answer any more questions on it. Jan 27 100 countries or an SUV?